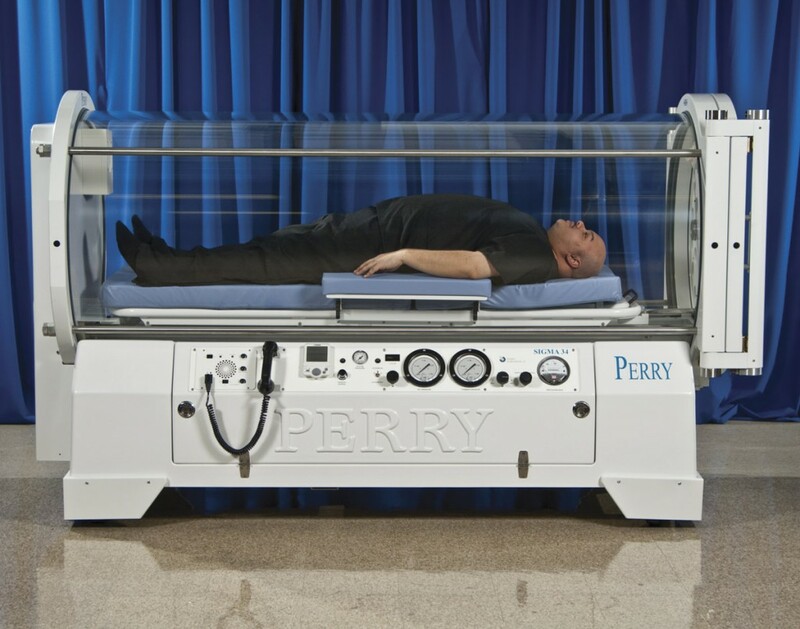 For over 20 years Perry Baromedical has held the honor of manufacturing the largest monoplace hyperbaric chamber in the industry, with the introduction of the SIGMA 36, Perry holds the added distinction of manufacturing the two largest monoplace hyperbaric therapy systems. The larger chamber sizes provide the patient with a more pleasant treatment experience. Confinement anxiety and other complications will be reduced if treatment is performed in the larger, more patient-friendly chambers. Adjustable stretcher and certified for patients up to 700 lbs. The following requirements must be met for proper operation of the SIGMA 36 Monoplace Hyperbaric System. Building must adhere to construction requirements specified in NFPA 99, Health Care Facilities. Optimal patient comfort is achieved if the room is maintained at 68°-72° F (20°-22.2° C). Flooring should not produce static electrical discharge. Carpeting is not recommended. Conductive flooring is preferred but not required. Air/Oxygen Supply: 50-90 psi @ 40 scfm (3.4-6.2 bar @ 1130 lpm). Pressure gauge and shut-off valve installed in accessible location in both air and oxygen lines. Termination to be 3/4” female NPT, 2 feet above floor for connection to chamber supply line. Installation to be in accordance with publication CGA G-4.1. Exhaust Line: One and one-half inch nominal diameter copper (minimum). The exhaust line should be run to the exterior of the building no less than eight feet above the chamber level in an area where no potential source of ignition or fuel exists. The exhaust line should be installed so as to obviate entry of rain or foreign objects. The termination in the chamber room must be 1-1/2″ NPT (F), located 2 feet above the floor for connection to the chamber exhaust hose. Electrical Service: 110 VAC outlet for communication system power supply and maintaining charge on 12 VDC backup battery. Chamber Ground: Chamber grounding should be in accordance with NFPA 99, NFPA 70, National Electrical Code, grounding and local electrical codes. Additional grounding instructions shall be provided as required. The Sigma 36 is supplied with all necessary hoses and fittings to easily connect to the customer provided services described above. All building services should terminate within three feet of the foot of the hyperbaric system. All Perry systems meet or exceed current requirements of ASME, PVHO-1, NFPA-99 Chapter 20, 21 Code of Federal Regulations, Chapter 1, Part 820 and are registered with the National Board of Boiler and Pressure Vessel Inspectors.